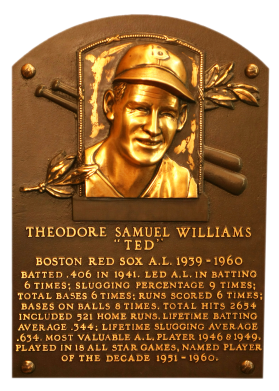 Ted Williams one desire was to walk down the street and have people say, "There goes the greatest hitter that ever lived." Arguably, he was. Despite missing nearly five years to the military, the Red Sox left fielder won two MVP Awards, six batting and four home run titles, and two Triple Crowns. "The Splendid Splinter" batted over .316 in each of his 19 seasons except one. 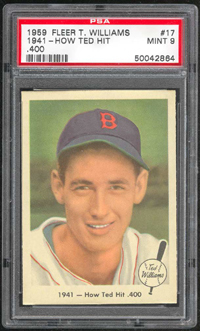 In 1941, "The Kid" hit a .406 mark. He's the last player to attain that plateau. He had 30 or more homers in eight seasons, 20 ore more in 16 seasons. "Teddy Ballgame" retired with a career average of .344, 2,019 walks, 521 home runs, and 1,839 RBI. 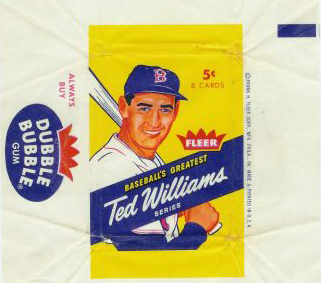 Comments: Ted Williams will always hold a special place in my collection. 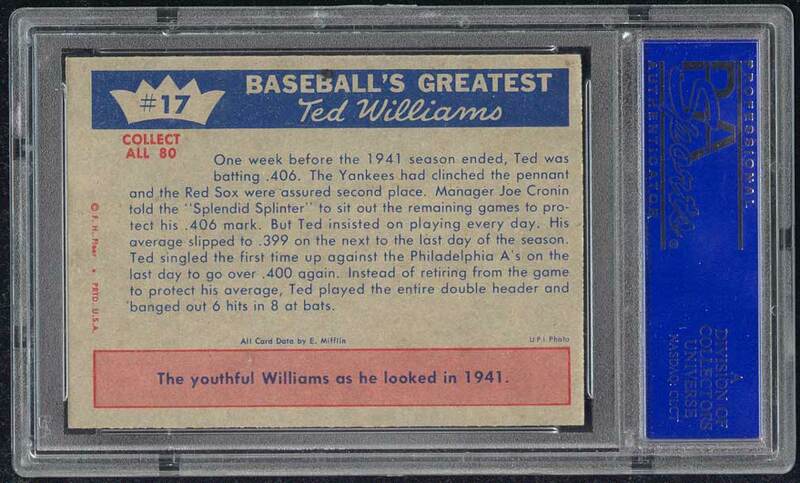 My very first vintage card was a 1951 Bowman Williams card I picked up in trade for aboout 10,000 commons when I first started collecting cards in 1991. It was a great trade and that card was locked away in an acrylic brick for a long time. Unfortunately, it's gone now - sold sometime in the late 1990s. 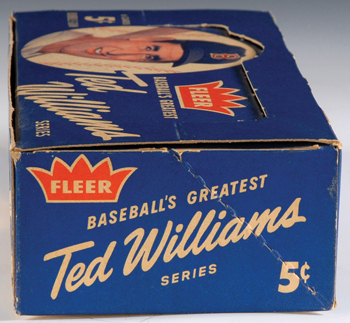 Around the same time, I purchased a PSA 7 '56 Topps Williams. 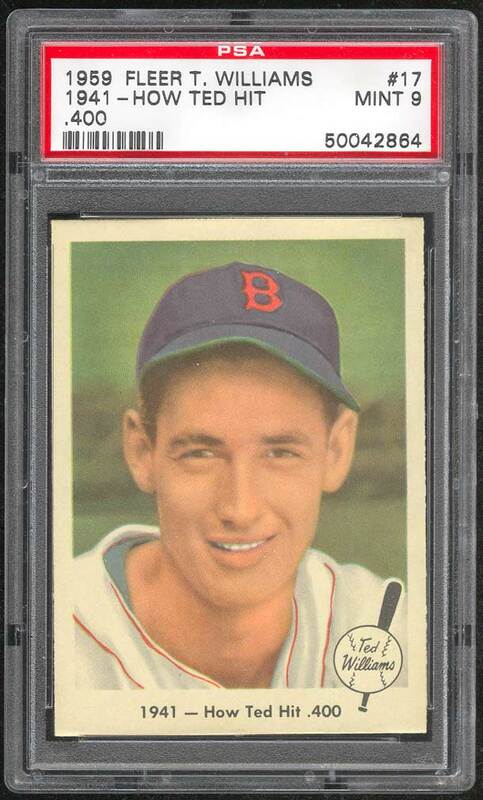 Within months of that purchase, I remember staying late at work, in my cubicle, synchronizing the computer clock with eBay, watching the seconds tick off and entering a last second snipe (before electronic snipe services were around) to win a gorgeous PSA 8 1956 Topps example in March, 2000 - an upgrade. I was so nervous and excited at the same time. 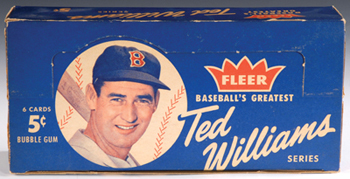 It was my portrait of Ted Williams until I replaced it with this PSA 9 in October, 2004. WOW! I love this card. Absolutely MINT. 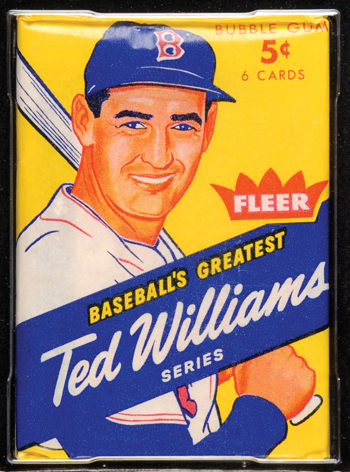 Description: This 80-card 1959 Fleer set tells of the life of baseball great Ted Williams, from his childhood years up to 1958. The full-color cards measure 2-1/2" X 3-1/2" in size and make use of both horizontal and vertical formats. 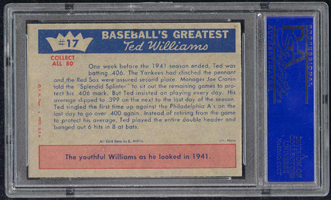 The card backs, all designed horizontally, contain a continuing biography of Williams. 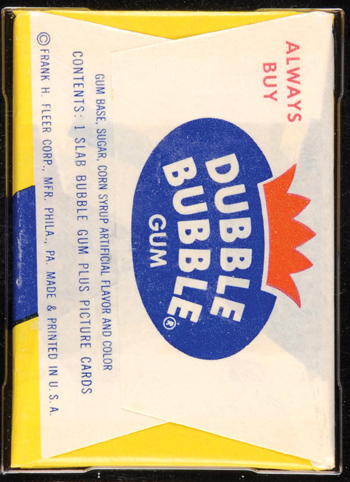 Card #68 was withdrawn from the set early in production and is scarce.